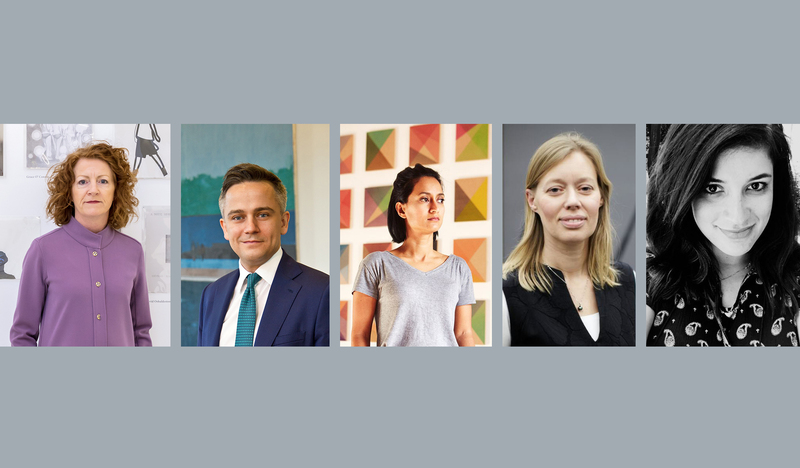 The panel includes Mary Doyle (Drawing Room Co-Director), Jon Sharples (Chair of the Simmons & Simmons Art Network), Rana Begum (artist) and Mary Findlay (International Art Curator, Deutsche Bank), and will be chaired by Laura Uccello (Business Development Manager at Momentous Fine Art). Drawing Biennial 2019 is a dynamic exhibition comprising over 200 drawings and includes work by leading and emerging artists from around the globe. Contributors to the Biennial include Rana Begum, Ryan Gander, Antony Gormley, Mona Hatoum, Idris Khan, Michael Landy, Cornelia Parker, George Shaw, Raqib Shaw, Alison Wilding, Rose Wylie and many others. Culminating in an online auction in the exhibition’s final two weeks, all works are available to purchase from a starting bid of £300. Proceeds from the auction support Drawing Room’s exhibition, learning and publishing programme and growth of its unique study library. Mary Doyle has worked in the visual art sector for over 25 years. As Senior Curator at the Contemporary Art Society, she managed the Special Collection Scheme for fifteen museums and galleries throughout England from 1995-2005. Prior to this, she worked at Arts Council National Touring Exhibitions, the British Council and several commercial galleries in London. She initiated the Drawing Room with co-founders Kate Macfarlane and Katharine Stout in 2000 and has co-directed the organisation since. Jon Sharples is Chair of the Simmons & Simmons Art Network and an Associate Solicitor in the firm’s Intellectual Property group. Alongside his legal career and his work on the Simmons & Simmons collection of contemporary art, he is a visual arts broadcaster, lecturer and curator. Jon is a trustee of Block 336 in Brixton and was one of the invited speakers on the Zabludowicz Collection’s 2019 Master Class programme. Born in Bangladesh in 1977, Rana Begum now lives and works in London. She graduated with a BA in Fine Art from Chelsea College of Art and Design and gained an MFA in Painting from the Slade School of Fine Art. Recent exhibitions include Space Light Colour, Djanogly Gallery, Nottingham, UK (2018); Solo Exhibition and Residency, Tate St Ives, Cornwall, UK (2018); Eruption from the Surface – The Origami Principle in Art, MARTa Herford, Herford, Germany (2018); The Space Between, Parasol Unit, London, UK (2016); Towards an Infinite Geometry, Jhaveri Contemporary, Mumbai, India (2015); Solo Project, Dhaka Art Summit, Dhaka, Bangladesh (2014) and No.10, The Third Line, Dubai, UAE (2013). Rana Begum’s commissions include Cleveland Clinic (2016), Argent/Kings Cross (2016), Westgate Oxford Alliance (2015), Westgate Oxford Alliance (2015), HCL Technologies Ltd (2014-15), Surbiton Health Centre (2013) and Marcol House (2010-12). Mary Findlay, B.A., is the International Curator at Deutsche Bank, London. After working at Goldman Sachs, she joined Flash Art, one of the leading international art magazines, before coming to the Deutsche Bank’s London Art Department in 1996. Mary oversees both the UK and American curatorial teams who manage the Deutsche Bank Collection, consisting of approximately 55,000 artworks globally. She also manages the bank’s cultural partnerships in these locations, including the 15 year sponsorship of Frieze Art Fair in London, New York and Los Angeles. She is the co-editor of Art Works: British and German Contemporary Art (Merrell Publishers, 2001). Laura Uccello is the Business Development Manager for Momentous Fine Art where she currently oversees strategic partnerships as well as logistics projects predominantly for large collections of fine art. She has advised private and public collections on best practices on transport, conservation and project management. She completed her Bachelor of Arts in Language Culture and World Trade at Pace University (New York) and her Master of Sciences in Art, Law and Business at Christie's Education/University of Glasgow. Her professional experiences also include roles at Christie’s London/New York as well as Tru Vue.